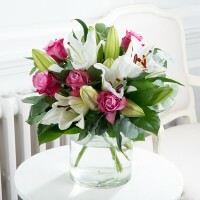 Unusual deepwater water roses simply stunning with white scented oriental lilies and rustic foliage. Perfect for the one you love this Valentine's. Please note: the vase is not included.